This darn headache that won’t go away! For the past few days, I have had this crazy headache that won’t go away no matter what I do! I took two painkillers and the pain persisted, I added more hours to my sleep and nada. I feel it mostly on my left eye and I’m concerned that it might have something to do with my Glaucoma. Yep. At 24 yrs old I have Glaucoma. I was diagnosed with it when I was around 15 yrs old. Everytime I tell someone this they always respond with a “OMG YOU’RE TOOO YOUNG TO HAVE GLAUCOMA! !” but I don’t believe in being “too young” when it comes to health problems. Diseases attack anyone at any age unfortunately. Another thing I’ve noticed is that people are almost always surprise I’m not blind LOL. I was lucky enough to catch my glaucoma in time before any damages occurred. For years now, I been taking eyedrops to control my eye pressure and so far no complications came up. But lately I’m wondering if this ongoing headache is related to my Glaucoma or if its just a “simple” headache that will eventually go away. 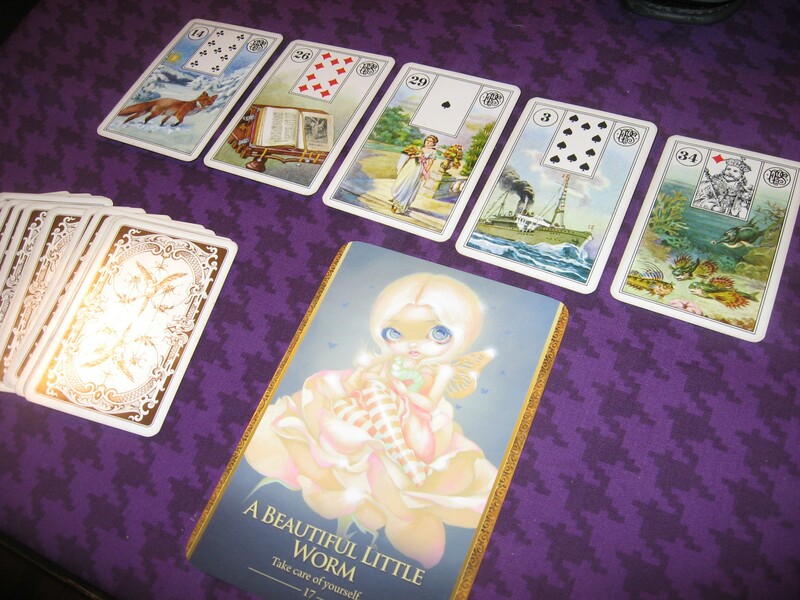 I was curious so I did a Lenormand reading on it using the “No Lay Out” method and the Oracle of the Shapeshifters deck. Question: What do I need to know about this headache? Keycards: I will be using the Woman to represent me and whats going on around me. Fox + Book shows me trying to get to the bottom of whats causing my headache. The book symbolizes researching and “not knowing” something while the fox reinforces me investigating. So far thats true! I was surfing the net on all possible causes that can trigger migraines and headaches. I can also see the fox/book symbolizing overworking. Especially when it comes to my college studies (book). Both the Ship and Fish connects with water so now this reading has me wondering; am I dehydrated? it was the first thing that popped in my head when I saw the ship/fish. I may not be drinking enough water than I originally thought. Ship also means moving away, letting go and Fish talks about being freelance. So far, this makes me think that a change from my usual college study routine would do me some good right about now LOL. I feel the ship/fish combo is encouraging me to explore hobbies and activities I enjoy and getting away from working too hard. The oracle card A Beautiful Little Worm reads “Take care of yourself” this card is about slowing down and restoration. Such a pretty card! Its one of my favorites from this deck. So overall, it seems I been working and studying too hard and need to escape from this routine for now and focus on hobbies and activities I enjoy so that way I can come back to my work energized. Theres also a possibility that I’m slightly dehydrated and need to drink more water. Hopefully this cracks the mystery of my headache LOL. Will update soon!